A fiscal calendar is an intimate part of job life and official works. Every company or working organization need it, and they are specially made for them. Auditing is done based on fiscal year. 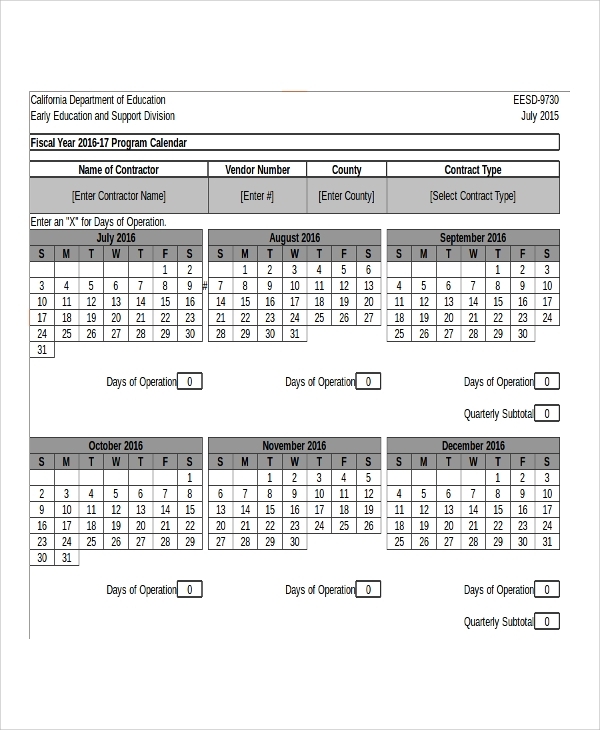 The following Calendar Samples have multiple formats such as monthly calendar templates, quarterly calendar templates and all of them have different applications and usages. 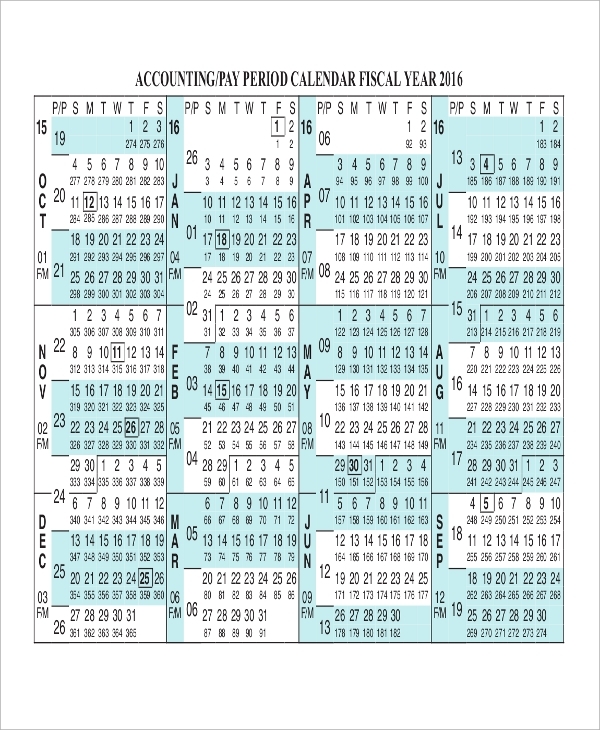 This is a perfect fiscal calendar for a retail shop or mall. It is for the convenience of workers, and it has multiple color marks representing different dates. One color is for sales release date, one for holidays, one of the special offers and likewise. It is divided into spring and fall season. 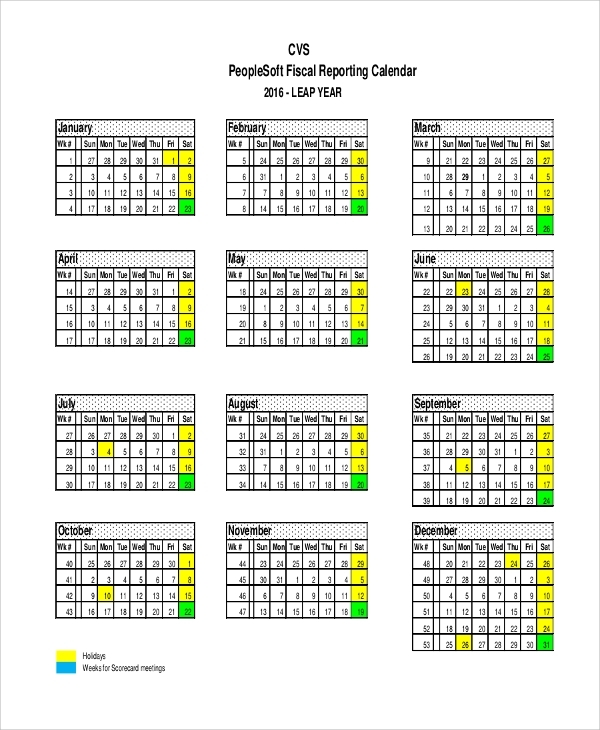 This is a fiscal reporting calendar that is useful in every working organization. It uses multiple colors to show the significance of different dates that will remind the employees of different tasks. Some dates are for meeting and giving an account of work in progress; some are for training, and special class and some are for discussing new projects and taking feedbacks. You may also see the Hourly Calendar Samples. This is a fiscal program calendar in Excel file. It is fully editable, and it is for scheduling meeting, interviews, marking dates for vendors to deliver services or products. Vendors can use it to mark the delivery dates and prepare a bill accordingly indicating the working days and hours. 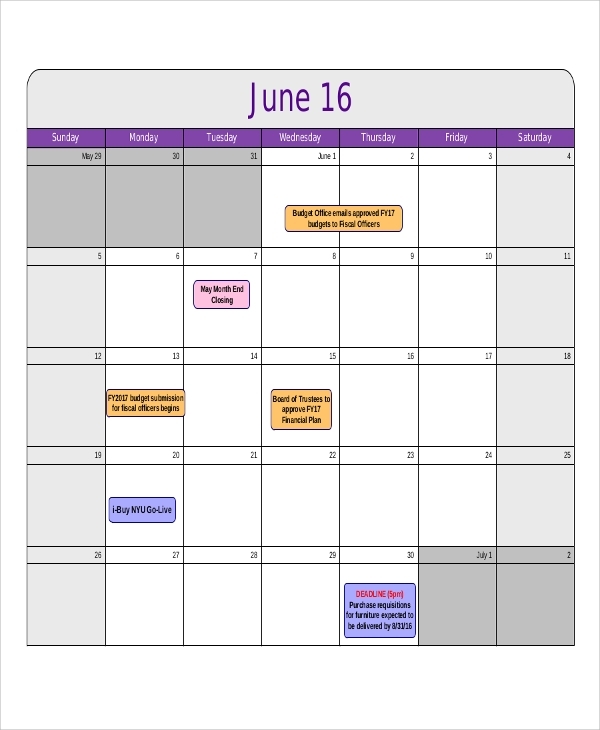 The above-listed calendar templates are printable and editable. It is useful for a vendor to mark the dates of delivery of products and send requisition for payment. 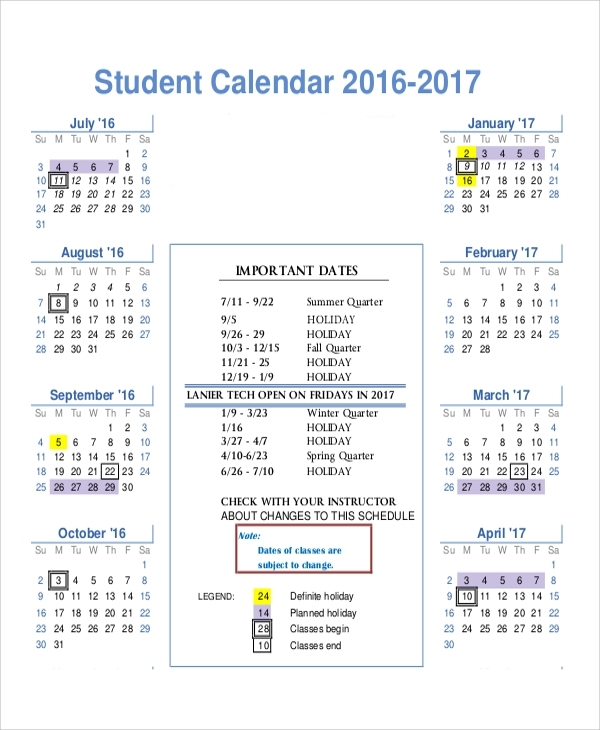 Fiscal program calendars are for marking the important dates for different important events in a working organization. Every worker needs to register their daily performance and progress in work, and it comes handy during performance evaluation. They are used for breaking down a project and lists the milestones to achieve on particular dates to make sure a project gets completed in due time. You may also see the Word Calendar Samples. 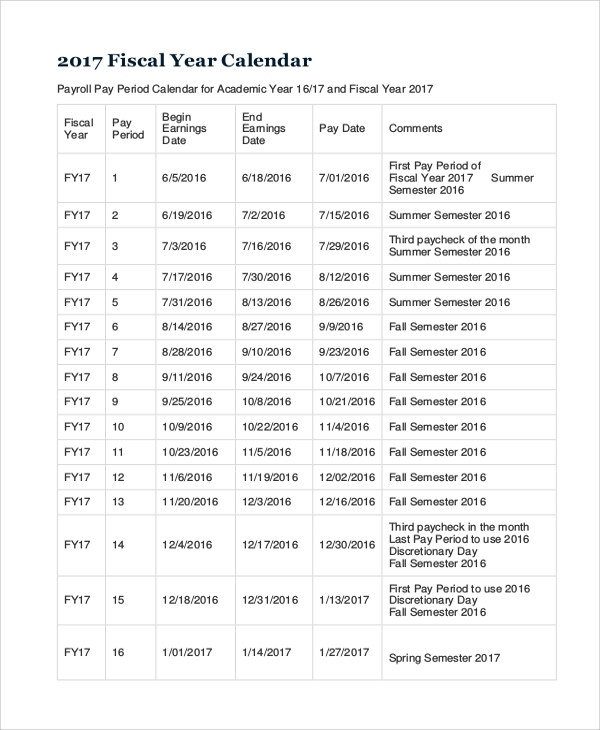 This is a fiscal year calendar which is divided fortnight wise. It is for marking the dates of payment and to notify the working period. There are provisions to write comments and mark the holidays in between the working period. It can be used for individual employees to keep track of their progress in work. This is a perfect fiscal monthly calendar template. Every month is provided individually, and there are spaces under each date to write special notes. It is useful for any organization to notify the particular dates and the events that will take places such as deadlines, and team meetings. The targeted audiences for the fiscal calendars are all the companies and organizations where employees work on regular basis. Companies need them to mark important dates for the clients to report them the progress of a project as well as for its employees to achieve milestones of projects in execution. Employees need them to report their daily work and performance with special notes to team leaders or team managers. They are also useful for vendors, students, and academics. 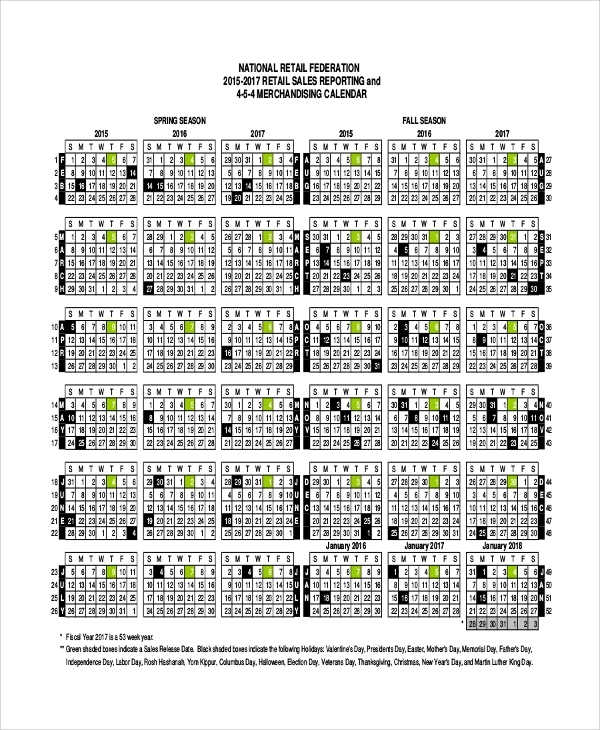 You may also see the Sample Printable Calendars. 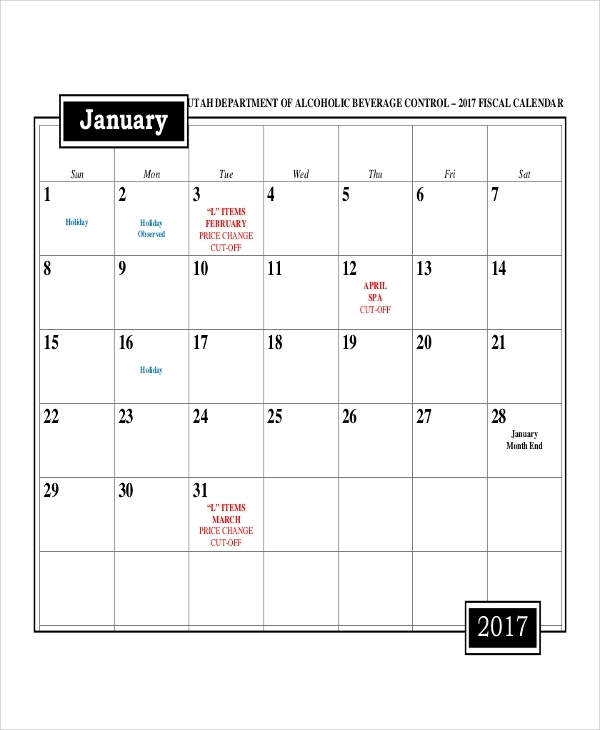 The above-listed sample calendars are fiscal year based, and they are tailor made for professional organizations. They are used for various purposes such as auditing purpose, notifying employees of important dates like deadlines, meetings, and performance evaluations. Employees have to report to the team leaders by writing special notes on every date to show the progress in work. Every project is accompanied with a fiscal calendar to mark the milestones to be achieved and already achieved. 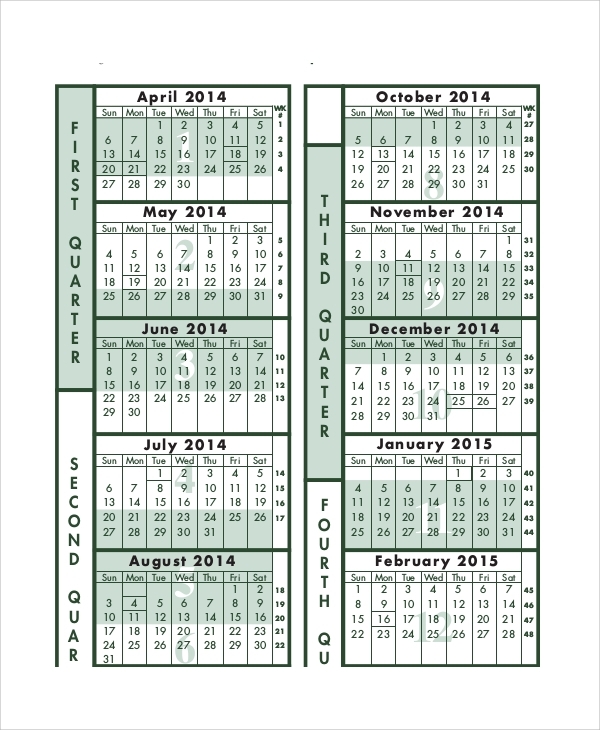 You may also see the Quarterly Calendar Templates.